Last week I did a review and background of Plum Deluxe, a site specializing in creating meaningful moments which includes drinking tea for all occasions. I was intrigued by the company and the founder and creator Andy Hayes agreed to do an interview for us to learn more about the company and their in-house created tea blends. After starting Plum Deluxe, why did you branch out to offer teas, as well as a tea subscription service? Plum Deluxe started out as an online community. After a few years, I personally was starting to feel a little dissatisfied at the limited connection I could have with people online, so we started hosting events this past year. But my heart was yearning for a product that people could hold in their hands and enjoy with friends and family. Since the most popular things at Plum Deluxe are food/drink, I either could start a winery or a restaurant or a tea company. I chose the easier one! Do you blend the teas yourself? If so, how do you go about crafting a blend? Yes, the blends are all done in-house. We start with an idea or an intention – for example, a tea good for after dinner. Then we gather ingredients that would be good for that purpose, using our own experiences or intuition. Then comes the tasting! We have a few community members that try our test teas and give us feedback. We tweak, taste again, and then the final products appear on the online shop. We also have a private Facebook group for all of our tea customers, and we always get great ideas and feedback from customers about what seasonal blends they’d like to try. Do you blend based on certain flavors, or healing properties, or both? Are there other factors that inspire a blend? Great question – it’s both! I am a huge proponent of the healing properties of tea, which influences the type of blends we choose to use. Thankfully, many healing herbs are also yummy! I would say that most often, it’s flavor that is the primary consideration, and then we add in healing elements where possible. There are exceptions, though – for example, we are rolling out a sleepy tea that started with the relaxation herbs and then we tweaked the combination for the best flavor profile. One other factor that plays into a blend is the look. We want our teas to look just as amazing as they taste, which drives choices on how we pick particular ingredients. How do your blends set Plum Deluxe apart from the competition? I would like to think that our approach to creating blends makes us unique. One comment I always get about our teas is that people love the pairing suggestions – for example, our reading nook tea says it is great for both reading and writing. We are also very mindful with every piece of our tea business – the choices on packaging (recycled, minimal, sustainable), the serving info (we offer recipes and other usage suggestions), and even how we name the blends is so intentional. While there are plenty of tea brands out there, we care. A lot. What are your most popular blends? What are your biggest challenges as an online tea merchant? Being online is a huge challenge because every tea merchant sells online, so standing out is difficult – as you know, part of choosing a tea is being able to smell it and taste it (and our teas smell amazing!). Since smell-o-vision has not yet reached mainstream, we have to use great photography and great descriptions to help people get a feel for the tea before they purchase. It’s not just about closing the sale – I want people to love their tea and thus it is important for us to guide them to a tea they’ll like, especially for tea newbies. What is your favorite part of being a tea merchant? I LOVE the fact that we can work on new products all the time. If a tea blend doesn’t sell well, we can tweak and try something new. Every season is a new chance to try new blends or new creations. It’s really just so fun. When did you first start drinking tea? I have to be honest, we didn't drink much tea growing up. Then I moved to Amsterdam, where I really got into fruit teas and mint tea – the Dutch have great taste in tea blends. Yum! I also got into white teas there. After that I lived for 5 years in Edinburgh, Scotland where tea is black, black black (with lots of milk and sugar). After mastering the art of dunking the biscuit in the tea, I was hooked. What are some of your own tea rituals? I like to end my day with hot tea and a good book – this is a great way to clear my mind and ease any stress or lingering worries, paving the way for a fantastic night’s rest. On weekends, I like to take the time to make my own tea lattes – brewing the strong tea, frothing the milk, having plenty of time to sip and relax with it. It’s such a treat. What are your future plans for the tea shop? We are expanding tea spa products (think wonderful tea-infused soaps and bath salts) – you may see a few items for sale during the holidays this year. We are also planning a few tea blending parties, where you can come and learn how tea blends are made and then make your own! Cities and dates coming soon. Thank you so much to Andy for the in-dept interview. I look forward to hearing more about the company, especially the spa tea products. Please also let us know about the blending parties! 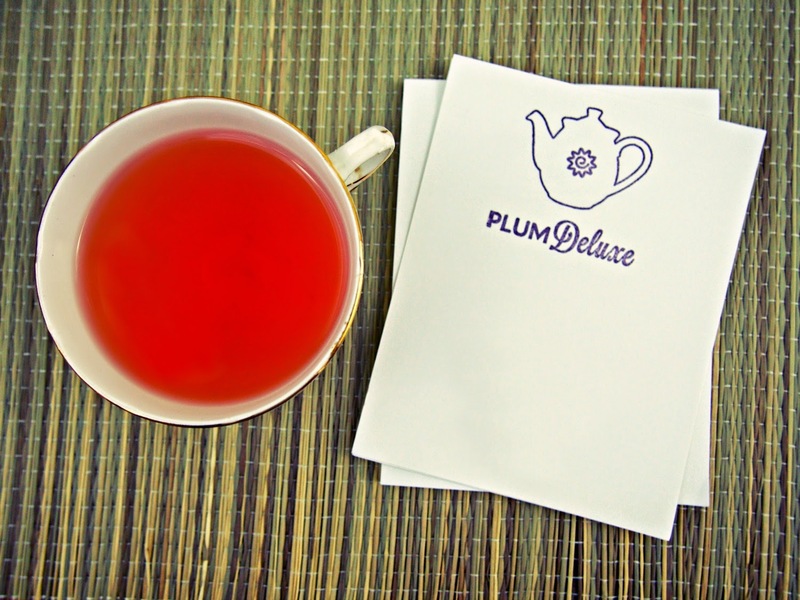 For more information on Plum Deluxe, you can visit their website here. I'm so curious about the tea blending parties! What's not to like - try your hand at tea blending, while sipping on tea and lovely snacks and lovely conversation!